This year’s program for La BF15 focuses on issues, devices and mechanisms inherent to the various aspects of exhibitions: works, space, display, surveillance, public reception, media, cultural meetings, etc. Wesley Meuris’s work fits in these questions, particularly focusing on the construction and understanding of space and knowledge. His work, consisting of diagrams, posters, drawings or life-sized models, is built through various types of modelling for demonstration spaces (zoological pens, hypothetical archives, museum furniture, exhibitions programs etc). His work focuses more on the contextualisation of the contents rather than the contents themselves, therefore highlighting the conditioning of our experiences. 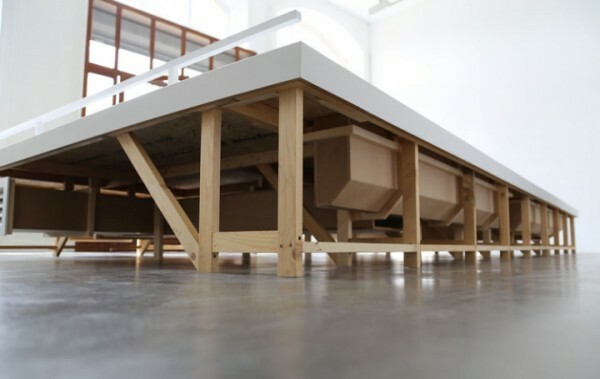 His exhibition at La BF15, entitled Expansion, points at the contradiction of spaces designed to fit human activity despite being cut off from all external reality by their mechanism. 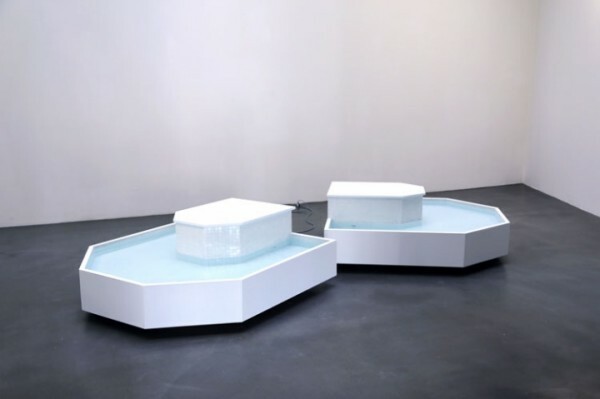 Wesley Meuris chooses to reveal the less obvious aspects of our environment’s domestication, by reconstructing flow dynamics in two works produced for the occasion. The first one, ROOM 36 AREA LW, takes the shape of an exhibition floor that is raised and crossed by air circulation. It becomes at once the sculpture, the pedestal, the architecture and mechanics of an atmospheric device, of which the drawing EXPANSION details strates. Realized from a technical vocabulary of plans, it reveals the thermal specificities inherent to the conditioning of the public’s perception. Under the canopy, BASIN, deconstructs the frame of a fountain, which still remains animated by the movement of water. Suspended between inside and outside, between the reality and its representation, these new productions reveal the mechanisms which influence the context of the exhibition, which constitute the extension of it. Wesley Meuris, ROOM 36 AREA LW, wood. © photo and production La BF15, Lyon 2014. All rights reserved. Meuris combines the archetypal forms that give the impression of a “semi-realistic” facsimile. Although the reference of the original object remains plausible, the result tends towards a generic abstraction that leaves the visitor in uncertainty as to the exact nature of the place. […] Turned inside out like a glove, the exhibition is traversed concurrently from the inside and the outside, revealing that concepts materialise not only outside. 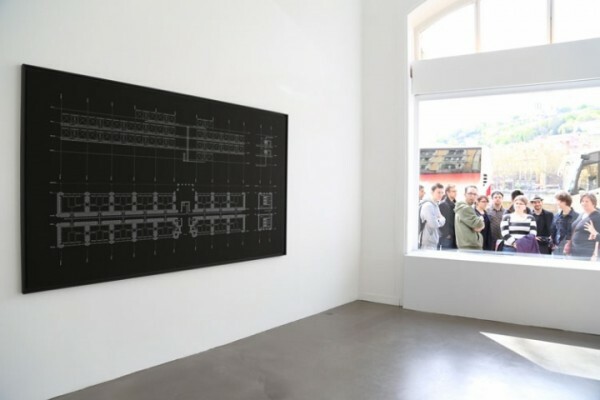 Florence Ostende, extracts from the text of the exhibition Sightseeing, Jérôme Poggi gallery, September 2013. Full version is available on the gallery’s website. The exhibition is curated by Perrine Lacroix. Wesley Meuris, EXPANSION. Photo Rag on dibon, wood frame. © photo and production La BF15, Lyon 2014. All rights reserved. Wesley Meuris, BASIN, wood, lighting and tiles. © photo et production La BF15, Lyon 2014. All rights reserved. Room 1: ROOM 36 AREA LW, 2014 Wood / EXPANSION, 2014 Photo Rag on dibon wood frame. Room 2: Project Advertisement, 2012, 2 photos Rag on dibon. Room 3: BASIN, 2014, Wood, lighting and tiles.